Great looking and extremely comfortable orthopedic shoes are the best choice for your feet. Experience the widest selection of orthopedic shoes in Colorado! Great looking and extremely comfortable othopedic shoes are the best choice for your feet. Experience the widest selection of Othopedic shoes in Colorado! 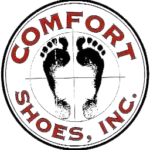 Comfort Shoes Inc., located at 6864 S University Blvd, Centennial, CO 80122, has been providing orthopedic shoes, comfortable shoes, orthotics, and cobbler services in Colorado since 1991. Bringing comfort into your life is our goal. Whether it’s a new pair of shoes, bringing back life to your old favorite shoes, custom made orthopedic shoes, or repair work on leather, vinyl or nylon, our team of well qualified experts can help you make life more comfortable. Our staff of Pedorthics, Nick Trushkov and Ozzy Fox, are ready and happy to assist you with custom services utilizing their many years of experience and knowledge. Professional shoe and boot repair for Allen Edmonds, Steve Madden, Lucchese, Dan Post, Louboutin, and many more!